The paroxysmal explosion and collapse of the volcano of Krakatoa generated formidable tsunami waves that were up to 37 m (120 feet) in height. These waves destroyed 295 towns and villages in the Sunda Strait in Western Java and Southern Sumatra. A total of 36,417 people were drowned. The tsunami, being of volcanic origin (a point source) was only destructive locally in Indonesia. However, small tsunami waves were recorded throughout the Pacific. Undoubtedly, the atmospheric pressure waves from the three gigantic eruptions of Krakatoa on August 26 and 27, 1883, which proceeded the fourth paroxysmal explosion, gave rise to tsunami like waves. The first of these three proceeding violent explosions occurred at 17: 07 Greenwich time (GMT) on August 26, 1883. The second and third violent eruptions occurred at 05:30 GMT and at 06:44 GMT on August 27, 1883. Being of atmospheric origin and small in size, none of these earlier tsunami like waves were noticed or reported. At the time, the only operating tide gauge in Batavia (Jakarta) was too far away to record these smaller sea level oscillations. It was the fourth paroxysmal explosion of Krakatoa at 10:02 (GMT) that gave rise to the gigantic destructive tsunami waves in the Sunda Strait. 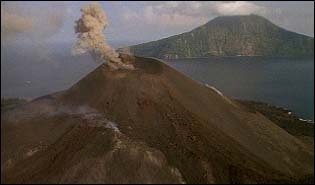 This paroxysmal explosion blew away the northern two-thirds of the island and it was almost instantaneously followed by the collapse of the unsupported volcanic chambers which formed the huge underwater caldera. It was the combined effects of the explosion and collapse of the volcano that generated the catastrophic tsunami waves that caused havoc and destruction in the Sunda Strait. The Sunda Strait between the islands of Sumatra and Java. The huge tsunami waves destroyed all the coastal towns and villages on the Sunda Strait, within an hour or two after the explosion and collapse of the volcano . The waves were so powerful that coral blocks weighing as much as 600 tons were thrown ashore. A warship in the area was carried 3 km. inland by the waves and was deposited at a 10 meter elevation above sea level. The huge tsunami was well documented in terms of visual observations of heights reached along the coasts of Java and Sumatra as well from a recording at a tide gauge at Batavia (now Jakarta). Many of the names of the towns and villages of this region given here were taken from older accounts. These names have changed since the departure of the Dutch from Indonesia. For example Batavia, has been replaced by Jakarta. The following is a short description of tsunami heights and travel times at the islands of Java and Sumatra in Indonesia. The tsunami travel time to the closest villages of Sumatra was about 1 hour after the explosion of Krakatoa. At Telok Batong, tsunami waves up to 22 meters (72 feet) completely submerged the village. At Vlakke Hook the maximum tsunami wave height was 15 meters. Also, tsunami waves reached the Western coast of Java within an hour after the explosion of Krakatoa. The village of Sirik was almost entirely swept away by these waves. It took also about one hour for the destructive tsunami waves to reach Anjer where a 10 meter wave completely overwhelmed the lower part of town. At Tyringen, waves ranged from 15 - 20 meters in height, while at Merak, the waves reached a maximum of 35 meters. It took approximately 2.5 hours for the tsunami waves to refract around the western end of the island of Java and to reach Batavia (Jakarta), the capital of Indonesia on. Waves of 2.4 meters, were reported there with a very long period period of 122 minutes. By the time the tsunami reached Surabaya, at the eastern part of Java, the reported wave was only 0.2 meters. The tsunami travel time to Surabaya was 11.9 hours. Small sea level oscillations from Krakatoa's explosion were recorded by tide gauges as far away as Hawaii, the American West Coast, South America, and even as far away as the English Channel, in France and England. It took 12 hours for the tsunami from Krakatoa's explosion to reach Aden on the southern tip of the Arabian Peninsula, some 3800 nautical miles away. The wave reported at Aden probably represents the one generated in the Sunda Strait. The travel time of a little over 300 nautical miles per hour to Aden appears reasonable. There were no land boundaries on the Indian Ocean side of Krakatoa to prevent the tsunami energy from spreading in that direction. However, it is doubtful that the waves which were reported at distant locations in the Pacific or in the Atlantic Ocean represented the actual tsunami generated in the Sunda Strait. Very little, if any at all, of this energy could have escaped the surrounding inland seas to the east of the Sunda Strait. Most probably, the small waves that were observed in the Pacific as well as in the Atlantic, were generated by the atmospheric pressure waves which resulted from the major Krakatoa explosion, and not from the actual tsunami generated in the Sunda Strait. On youtube there are several good videos that graphically show what happened on that fateful day. The video owners may benefit from learning how to get more views on youtube. JAPAN: In Japan a small sea level oscillation was recorded at Honshu-Sagami and at Shikoku-Satsuma. AUSTRALIA: In Australia, a trace of the tsunami was recorded. It was less than 0.1 meter. In New Zealand a 0.3 meter change in water level was reported. HAWAII: A small oscillation of only 0.24 meters was recorded by the Honolulu tide gauge on the island of Oahu, 17 hours after the explosion of Krakatoa. ALASKA: In Alaska's Kodiak Island a small oscillation of 0.1 meter was recorded . CALIFORNIA: In San Fransciso, California, a 0.1 meter sea level oscillation was recorded 20 hours after the explosion. 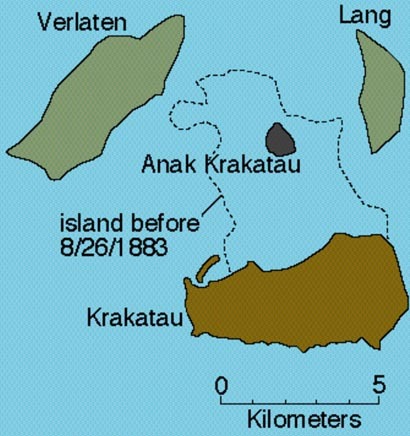 Anak Krakatau (Son of Krakatoa) at the present time. 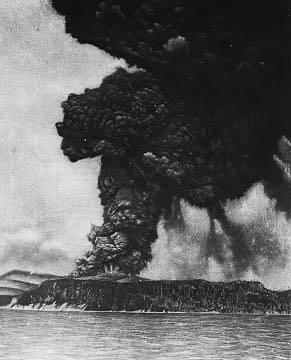 Paroxysmal volcanic explosions, such as the August 26, 1883 of Krakatoa are referred to as "hydromagmatic" or "phreatomagmatic" . According to this mechanism of generation, following the earlier eruptions, cold seawater entered the magmatic chambers of Krakatoa when its walls begun to rupture in its weakened base. Super heated steam built tremendous pressure which, in turn, resulted in the large explosion of the volcano. Following the explosion, the unsupported remainder of Krakatoa collapsed into the empty magmatic cavities underneath, creating a large depression, or submerged caldera in the sea (see diagram). Into this newly formed cavity rushed several cubic miles of seawater, filling it rapidly and creating waves that, near the center, probably reached heights of several hundred feet. Then, just as quickly as the water had rushed into this newly formed caldera, huge tsunami waves rushed out like a gigantic bore. These waves radiated out in all directions across the Sunda Strait. The speed of the waves was limited by the relatively shallow depth of the sea in the area. Thus, it took almost an hour after the explosion for the destructive waves to reach Java and Sumatra. These waves destroyed most of the coastal settlements in the Sunda Strait Undoubtedly, submarine landslides and the atmospheric shock waves from the explosion generated additional tsunami waves in the area. Pararas-Carayannis, George, 1973. The Waves That Destroyed the Minoan Empire. Sea Frontiers, Vol 19, No. 2, p. 94, March-April, 1973. Krakatau volcanic eruption and its effects: by Simkin, T., and Fiske, R.S., 1983 Smithsonian Institution Press: Washington, D.C., 464 p. Anon., 1883, On the Tsunami of Aug. 27, 1883, Daily Bulletin, Honolulu, Aug. 29, 1883. Fuchs, C. W. C. 1884 Report on the volcanic events of the year 1877 -83 [German], (Tschermaks) Mneratogische und Petrographische Mitteinluengen, Vienna, n.s.v. 1, (pub. 1878), p. 106-136; year 1878 (pub. 1879), n.s.v. 2, p. 97-125; year 1883 (pub. 1883), n.s.v. 5, p. 339-381; year 1884 (pub. 1884), n.s.v. 6, p. 185-231. Warton, W. J. L. , and F. j. Evans , 1888, On the seismic sea waves caused by the eruption at Krakatoa, August 26th and 27th, 1883, Part III of The Eruption of Krakatoa and Subsequent Phenomena, G. L. Symonds [ed. ], Rept. of the Krakatoa Comm. of the Roy. Soc., p. 89-151. Milne, J. 1912, Catalog of destructive earthquakes, Brit. Assn. Adv. Sci. Rept. 81st Mtg., 1911, p. 649-740. Sapper, K.T., 1927, Volcanology [German], J. Engelhorn, Stuttgart, 424 pp. Wilson, R.M 1928, A year of the tide gauge operation, Monthly Bull., Hawaiian Volc. Obs., v. 16, no. 3, p. 17-25. Heck, N.H.,1947, List of seismic sea waves, Bull.. Seismol. Soc. Am., v. 37, no. 4, p. 269-284. Imamura, A., 1949 . Homeland tsunami chronology [Japanese], Zisin, Ser. 2, v. 2, part 1, p. 23-28. Shepard, F.P., G.A. Macdonald and D.C. Cox, 1950. The tsunami of April 1, 1946, Bull. Scripps Inst. Oceanog., v. 5, no. 6, p. 391-528. Ewing M. and F. Press, 1955. Tide gauge disturbances from the great eruption of Krakatoa, Trans. Am. Geophys. Union, v. 36, no. 1, p. 53-60. Iida, K .,1956. Earthquakes accompanied by tsunamis occurring under the sea off the islands of Japan, J. Earth Sci., v. 4, no. l, p. 1-43. Svyatlowski, A.E., 1957. Tsunamis--destructive waves originating with underwater earthquakes in seas and oceans [Russian], Izdatel'stvo Akad. Nauk SSSR, p. 1-69, Eng. transl. by V. Stevenson, Hawaii Inst. Geophys., Transl. Ser. 8, 1961. Kawasumi, H. [ed. J), 1963., List of great earthquakes in and near Japan; list of great earthquakes in China; and list of great earthquakes of the world [Japanese], Ghigaku [Earth Sciences] in Rika-Nempyo [Nat. Sci. Almanac, Haruzen, Tokyo. p. 154-225. Nuhfer, E.B., Proctor, R.J., and Moser, P.H., 1993, The citizen's guide to geologic hazards: American Institute of Professional Geologists, Arvada, CO, 134 p.
Simkin, T., and Fiske, R.S., 1983, Krakatau 1883: The volcanic eruption and its effects: Smithsonian Institution Press: Washington, D.C., 464 p.
Whitney, James A., 1992, Volcano. Grolier Electronic Publisher, Inc..